Best dual-core phone: which should you choose? The pace of development in mobile phones has been incredible in the last few years. More and more dual-core smartphones are arriving, many with processing speeds of 1GHz or above. The advantage of going dual-core in these phones is that it offers more capability for multitasking and video, two features of mobile phones that have become more prominent. With smartphones able to replicate much of a PC's functionality, juggling all of that at once needs a good amount of parallel processing power. 1080p video recording used to be a specialist capability, but it's arrived on many phones along with the power of dual-core CPUs. It's not just about having more power in your phone, but about being able to do more with it. This is our regularly updated round-up of the current crop of dual-core smartphones, so you can see what each offers and discover which one's right for you. As soon as we saw the Samsung Galaxy S2, it was clear it was going to a phone to watch. Over the next few months, we got more information and the news that the handset would be bumped from 1GHz to 1.2GHz, which promised blistering speed when coupled with the healthy 1GB of RAM. Plenty of on-board storage means accessing the stored apps and media should be lag-free, too. When we finally got our hands on a review unit, it turned out to be just as fast as we were hoping. The Samsung Exynos system-on-a-chip (which may be replaced by Nvidia Tegra 2 in some regions) never gave us any slowdown problems, and the ARM Mali-400 GPU makes graphically intensive apps such as Google Maps run as smoothly as we've ever seen. While it is perhaps not the groundbreaking handset that many were hoping for, the iPhone 4S is still a top performer. It sports the same good looks as the iPhone 4, and thanks to its 1GHz dual-core processor (the same one as is used in the iPad 2) it's now faster than ever. Although on paper the specs don't look as good as the Samsung Galaxy S2, we found it to be just as slick and powerful in use. The 8MP camera is one of the best smartphone snappers on the market, and Siri has proven to be a surprisingly impressive tool. If it weren't for a few minor gripes, such as the modest 3.5-inch screen size and the lack of flash, this would be topping our list. But even so, it's a remarkable phone, and if you can stomach the price tag you won't be disappointed. It doesn't seem all that long ago that we were singing the praises of the HTC Sensation, but already there's an improved version available. The main changes come in the form of Beats Audio and a beefed up processor. While the original Sensation was hardly lacking in power, the improved 1.5GHz dual-core processor really is head and shoulders above most other phones. Beats Audio, meanwhile, provides a massive boost to sound quality on the handset. That is, assuming you use the supplied Beats Audio earphones. Other than that, the HTC Sensation XE remains largely unchanged. But that's no bad thing. Thanks to a sharp screen, solid build quality and a surprisingly accurate keyboard, the Sensation was already a highly appealing smartphone. The additions in the XE are just the icing on the cake. The only major issue is its battery, which struggles to last a day under moderate use. That's a shame, but it's the only real blemish on an otherwise near-perfect handset. The Samsung Galaxy Nexus is the latest 'pure Google' phone to appear on the market, and Samsung and Google have clearly tried hard to pack in as many features as possible. The big one of course is that it is the first phone to run Android 4.0 Ice Cream Sandwich. This really is a complete overhaul of the existing Android operating system, and for the most part it's a welcome one. It also brings with it some fun features such as facial unlock, which might be a bit of a gimmick but will make you feel like you're in a sci-fi movie. The Galaxy Nexus also has a brilliant 4.65-inch Super AMOLED HD screen, and is one of very few phones to come with NFC, which goes some way to future-proofing it. Surprisingly, for all its innovative technology, it does drop the ball in some areas. For a start, there's no micro SD card slot, so the built-in storage is all you get. Its camera is also a bit of a disappointment, at only 5 megapixels. Still, for an early taste of the future of Android smartphones, this can't be beaten. Motorola has resurrected the Razr brand and gone all out to make sure it's still a flagship handset. With a 1.2GHz dual-core processor, 1GB of RAM and an 8MP camera it is, on paper, very similar to the Samsung Galaxy S2. And as with the Galaxy S2, it's super slim and has a large, sharp screen. Not everything about it reminds us of the Galaxy S2, though. For one thing, the overlay that Motorola has added to the Android system is attractive, and comes with useful features such as resizable widgets. However, the Razr only has five home screens, and they'll fill up fast if you plan to actually use many widgets. The battery isn't that great either, so - given how similar they are - the Samsung Galaxy S2 remains a better prospect. But that doesn't stop this from being a great handset in its own right. Samsung seems to be trying to carve out a new product niche with the Galaxy Note. While we're not sure how much of a market there is for it, its quality is undeniable. With a 5.3-inch screen, this really is a giant in the world of smartphones. In fact it's just about big enough to satisfy tablet cravings as well. Under the hood it's basically a Galaxy S2 with a slightly faster processor (1.4GHz dual-core instead of 1.2). Since the Samsung Galaxy S2 has topped our list, that's no bad thing at all, so it really comes down to the screen. For some, the size will be a selling point, and if you like the sound of a phone and a tablet rolled into one then this is for you. But we can't help but feel that for many people it will just be too big. It's barely pocket sized any more, and can be cumbersome to use, particularly if you've got small hands. That said, if you do want a tablet/phone hybrid then this is the best (and currently only) option. Despite the name, the Motorola Atrix 2 is not the next generation of the Atrix. Instead it offers a few small updates, such as a new 8MP camera, bringing it in line with other high-end smartphones. It also comes with a slightly larger screen, at 4.3 inches (the original Atrix had a 4-inch screen). However, it still lags behind in other areas. The 1GHz dual-core processor has not seen an update, leaving it slightly weaker than the 1.2GHz dual-core processors that most of the phones in this list use. And while the screen is fine, it's noticeably worse than many of its competitors. However, the handset still has a unique selling point in its Lapdock accessory, which can be used to transform it into a miniature laptop. This makes it great for business users, and for internet use in general. It's worth mentioning that the Atrix 2 - a minor update - isn't being released in the UK, but the original Motorola Atrix remains a viable option, and is only slightly worse. We won't beat around the bush here. The LG Optimus 3D has one real selling point, and it's in the name. If you want a 3D smartphone, you have very few options, and to its credit the LG Optimus 3D does a reasonable job of it. With glasses-free 3D technology that genuinely works, you'll be able to take some impressive 3D photos and videos. It also has a very accurate touchscreen keyboard. With that out of the way, there are a lot of not so impressive things about the handset. Its 1GHz dual-core processor is a little slower than we'd like, and it only has 512MB of RAM. This is noticeable in use, since the handset can sometimes be slow to respond, which is the last thing you want when you've paid for an expensive dual-core phone. The battery life is also pretty appalling, and while the impressive 3D can probably be blamed for that, it does little to cushion the blow when you can't even get a day's use out of it. If you really want a 3D phone, this is your best option at the moment, but for everything else there are much better phones on the market. The LG Optimus 2X has the distinction of being the world's first dual-core phone, beating everyone else to market by a slim margin. Powered by a 1GHz Nvidia Tegra 2 system-on-a-chip and sporting 512MB of RAM, it's got the potential to be fast, though is beaten by the Galaxy S2 both in spec listing and in real use. However, these slightly milder specs (they're still pretty sharp) have meant that LG is offering the Optimus 2X at an incredible price - you can pick it up for free for less £25 per month. In our Optimus 2X review, we found that it was just about as fast as we'd hoped. Some parts of LG's tweaks to Android seemed like the could have used a little more optimisation here and there, but many apps ran unbelievably fast, and 3D games played extremely smoothly thanks to Nvidia's low-power GeForce GPU. We had high hopes for this phone. The reliable quality of HTC combined with the almost unique selling point of a 3D screen sounded like a match made in heaven. Sadly it wasn't to be. 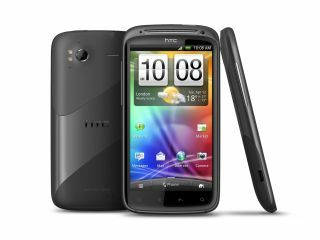 On the plus side it has a fast 1.2GHz dual-core processor, while HTC's sense interface is as fast and attractive as ever. The problem really is with the 3D itself. The 3D content doesn't look quite as good as it does on the LG Optimus 3D and, disappointingly, the camera only takes 3D pictures at a quality of 2MP, which just isn't good enough. On top of that, viewing 3D content quickly becomes uncomfortable on the Evo 3D, and can even lead to headaches. On the one hand it's quite a powerful smartphone, and 3D aside it probably tops the LG Optimus 3D, but if you're not fussed about 3D content there are many better phones available, and you need only look at this list to find them. Equally, if you are after 3D then the LG Optimus 3D does a better job of it. The HTC Evo 3D then is not a terrible phone, just a terribly disappointing one.